Arthur Brown, wearing a helmet with flaming horns, proclaims himself “the god of hellfire” and it only gets Halloweenier from there. Black Sabbath, singing a song called “Black Sabbath” using a diminished fifth / augmented fourth interval known as diabolus in musica. Bam. Halloween. Dwight Fry (no ‘e’) portrayed “R.M. 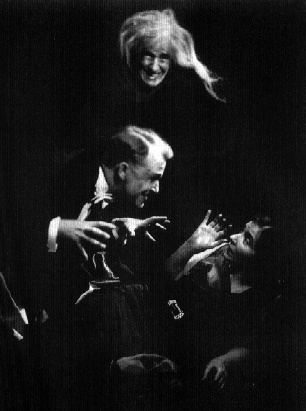 Renfield” in the 1931 screen adaptation of Dracula. Alice Cooper added the ‘e’ and the actual insanity later. The Demon makeup is nice, but what really makes this work is the gallons of stage blood and oblique references to being Satan’s offspring. I had to pick just one Roky Erickson song for this list? Are you kidding me? I think this was the theme of my senior prom. But don’t quote me on that. I didn’t go. Remember this one from the soundtrack to Tales from the Crypt Presents Demon Knight (1995)? This song is scarier than that movie. Pumpkin Jack approved. This version appears on the 2006 special edition release of The Nightmare Before Christmas soundtrack. I heard this song performed live at The Beat Kitchen in Chicago, and then what’s that? It’s on the soundtrack to The Collapsed (great film, if you haven’t seen it). Gothic Blue Book V: here in time for Halloween! Gothic fiction originated in the 18th century with Horace Walpole’s THE CASTLE OF OTRANTO, and really found its feet in the 19th century with purveyors such as Edgar Allan Poe, Sheridan Le Fanu, and Mary Shelley peddling horror, death, and emotional truth in the pages of their works. So this Halloween week, give yourself a treat that definitely won’t have a rusty razor blade wedged in there and pick up a paperback copy of GOTHIC BLUE BOOK V: THE CURSED EDITION, edited by the esteemed Cynthia Pelayo. Halloween started early last night at Barnes & Noble in Racine with HorrorFest 2015, featuring W.D. Gagliani, John Everson, Candice Shatkins, and me reading some of our favorite stories and discussing the things that drew us to horror. If you missed it, that’s okay. I read the first chapter of LOSING TOUCH, about Morgan Dunmore’s first embarrassing experience phasing through solid matter. I’ve never read that passage in a group setting before, and now I remember why. Let’s just say that the reasons are scatalogical in nature. Gagliani shared a passage from his Nick Lupo “Wolf Cycle” series about Lupo’s father, Franco, who hunted and killed werewolves in Nazi-occupied Italy during World War II. The series begins with WOLF’S TRAP, and is followed by WOLF’S GAMBIT, WOLF’S BLUFF, WOLF’S EDGE, WOLF’S CUT and WOLF’S BLIND, coming in November. Everson read “The Right Instrument” from VIGILANTES OF LOVE, which is about a jingle writer who, struggling to make the rent and dumped by the person he loves, is gifted with a new piano that solve all his problems … from a certain point of view. Obi Wan Kenobi would be proud of the logic. Shatkins told us about Kenosha’s town blasphemer, Louis Knapp, a churchgoer in the 19th century who, fed up with what he called the “priest-craft”, had monuments carved and placed in Green Ridge Cemetery lambasting organized religion. The true story is included in her book, HAUNTED KENOSHA: GHOSTS, LEGENDS, AND BIZARRE TALES. 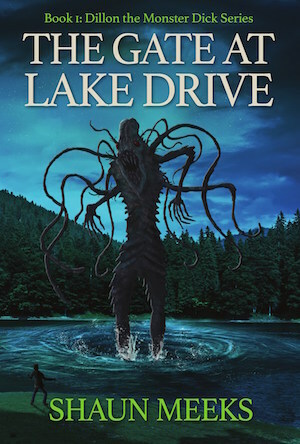 Shaun Meeks is the author of AT THE GATES OF MADNESS, BROTHER’S ILK, DOWN ON THE FARM, SHUTDOWN, THE GATE AT LAKE DRIVE and “And Midian Whispered Its Name” appearing in MIDIAN UNMADE: TALES OF CLIVE BARKER’S NIGHTBREED, edited by Joseph Nassise. Shaun Meeks lives in Toronto, Ontario with his partner, model and Burlesque performer, Mina LaFleur. Together they own and operate their company L’Atelier de LaFleur. Shaun has been writing for many years now and is a member of the Horror Writers Association. He is the author of Shutdown and the novelette, Down on the Farm. Now available in print and eBook. Ghost stories are as old as literature, with prime examples like Homer’s THE ODYSSEY and the Biblical novella “Samuel” (not to be confused with its cash-grabbing sequel, “Samuel II“). That’s less than eight cents a story when you order LOST IN THE WITCHING HOUR for Kindle before midnight on Halloween. At that price, you could order a few more 99¢ e-books for your virtual plastic pumpkin and not feel the pinch. Might I suggest Breaking Fate Publishing’s INSIDE THE MIRRORS and DEADHEAD MILES? And don’t forget … my novel LOSING TOUCH is also just 99¢ now through October 31. Get your scary on at Barnes & Noble in Racine the evening of Saturday, October 24 with HorrorFest 2015. This year’s event features W.D. Gagliani (WOLF’S TRAP), John Everson (NIGHTWHERE), and Candice Shatkins (HAUNTED KENOSHA: GHOSTS, LEGENDS, AND BIZARRE TALES), and I’ll be signing copies LOSING TOUCH, featuring a foreword by Piers Anthony. LOSING TOUCH, on the shelf at the Racine Barnes & Noble. WOLF’S TRAP is the first installment in the “Wolf Cycle” by W.D. Gagliani, featuring Detective Nick Lupo. WOLF’S TRAP is followed by WOLF’S GAMBIT, WOLF’S BLUFF, WOLF’S EDGE, WOLF’S CUT and WOLF’S BLIND, coming in November. Along with David Benton, Gagliani also co-authored “Claire de Lune” for the anthology X-FILES: TRUST NO ONE, edited by Jonathan Maberry. John Everson’s NIGHTWHERE was a nominated for the 2012 Bram Stoker Award® for Superior Achievement in a Novel. He was a previous Stoker winner with his debut novel, COVENANT. His works also include VIOLET EYES, THE FAMILY TREE, and “Voyer” in the anthology QUALIA NOUS, featuring “The Jaunt” by Stephen King. HAUNTED KENOSHA: GHOSTS, LEGENDS, AND BIZARRE TALES by Candice Shatkins, a founding member of the Paranormal Investigators of Kenosha, explores lycanthropy, shipwrecks, and burial sites right here in our own backyard. Find out about local history and legends in Kenosha County from one of the area’s foremost authorities on the weird and unsettling in Southeast Wisconsin. It all starts at 5:00 p.m. sharp on October 24 at Barnes & Noble in Racine, 2710 South Green Bay Road in the Southland Center. It’ll be two straight hours of readings, horror talk, and maybe a Q&A to get you in the Halloween spirit. We’ll see you there! You are currently browsing the exlibrislarsen blog archives for October, 2015.